2. 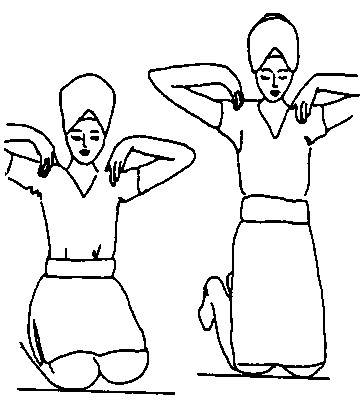 Sit on heels (Vajarasan/Rock Pose) Hands on Shoulders. INHALE THROUGH MOUTH as you rise up to a kneeling position EXHALE THROUGH NOSE as you return to Rock Pose. Continue for 3,5 Minutes. 3. 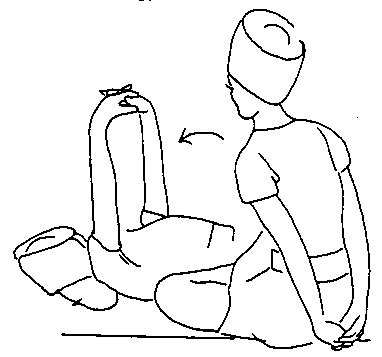 Sit in Easy Pose (Sukhasan) Hands on Knees. Grind your spine in wide circles, moving powerfully. Lose Weight! Lose Fat! Move! Continue for 3,5 Minutes. 4. Sit in Easy Pose, Hands in Venus Lock behind your back. 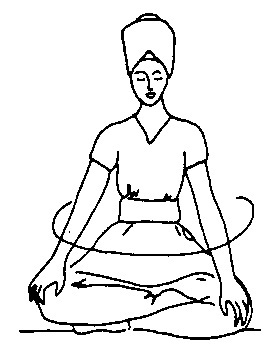 INHALE THROUGH YOUR MOUTH as you bend forward into YOGA MUDRA (bringing your forehead to the ground in front of you, with hands interlaced behind your back in Venus lock raised to the sky). EXHALE THROUGH YOUR NOSE sitting back up into Easy Pose. Continue 3 minutes. This will create the balance of energy. 5. Lie flat on your back in Corpse Pose (hands are palms up) and vibrate at the navel point. (Siri Singh Sahib ji played the gong for this meditation.) 5-7 minutes.